It was a Black & Mild. Initial reports accused Sharpe of perhaps substituting a Black & Mild with one of the lighter, more delicate flavors. Opinions were split on whether he used the apple or wine flavors, while some even suggested that he was attempting to perpetrate a hoax and actually smoked the light-skinnededed version: Black & Mild Milds. We can report with confidence now that it was indeed a regular-flavored Black & Mild. Sharpe apparently prefers the plastic tip to the more bougie wood-tipped variety. Our forensics analysts in the CSI Unit (Cigar Smoking Investigation) determined that Sharpe actually used a process called “freaking” to get maximum smokability and health consciousness from his Black. We used high-resolution imaging technology to notice the subtle change in angle from the tip to the cigar, hinting that Sharpe removed the “cancer paper” and reassembled the cigar in a process known as “freaking” (recommended by 4 out of 5 Black & Mildologists). Zooming in on the pool in the background, we saw tiny flakes of tobacco floating in the water, indicating that freaking had taken place. In fact, an Instagram post revealed that Sharpe may have used a very advanced freaking technique that involves lighting the cigar before freaking it, to seal one in of the prefreaked Black. He is on the Hen-Dog. We are giving Sharpe the benefit of the doubt on this one. Correction: White people know what a Black & Mild is. If there is anyone who had no clue what a Black & Mild was, they are probably white. So there you have it. 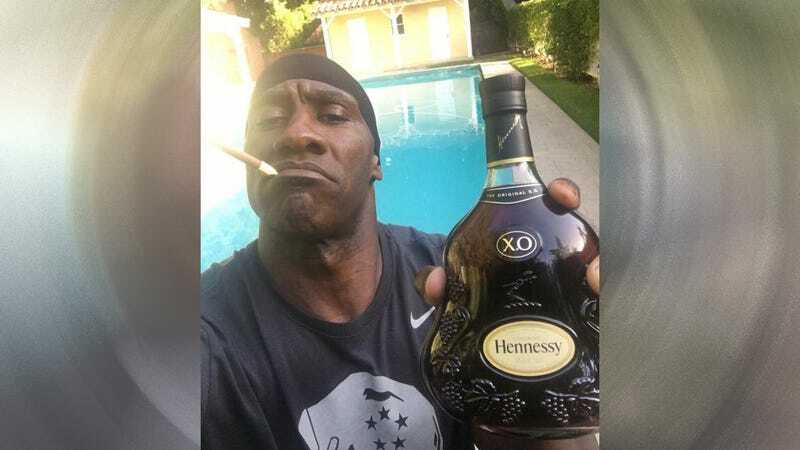 The Root’s investigation unit has uncovered the fact that Shannon Sharpe’s epic blackness is anything but mild. In a time of unrepentant respectability, we hope that Sharpe will not appear on his Fox Sports 1 show Tuesday and say that he was not smoking a Black and drinking cognac ... he was praying. Although to be fair, that is how I take my communion.